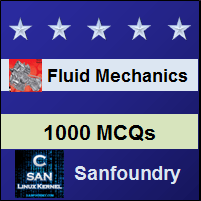 This set of Fluid Mechanics Multiple Choice Questions & Answers (MCQs) focuses on “Geometrical Properties of Triangular Section – 1”. 1. What is the wetted area for a triangular channel having depth y and the side slope being Z? 2. Calculate the wetted perimeter of a triangular section having depth y and the side slope is Z. 3. Calculate the wetted perimeter of a triangular section having a depth of 4m and the side slope is1H:1V. 4. Estimate the wetted area of a triangular channel having a depth of 5m and the side slope is 2H:1V. 5. What is the top width of a triangular channel having a depth y and side slope Z? 6. Determine the hydraulic depth of a triangular channel having the side slope Z and depth y. 7. Estimate the top width of a triangular channel having a side slope of 1H:2V and depth of 5m. 8. 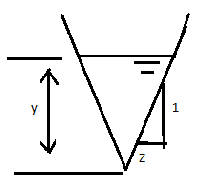 What is the Hydraulic Radius of a triangular channel having a depth y and side slope Z? 9. 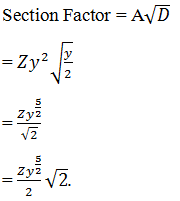 What is the section factor for a triangular channel having depth y and side slope Z? 10. Calculate the section factor a triangular channel section having side slope 1H:4V and depth of 8m.